Yesterday I showed you a card that I had painted with white embossing paste and gilded with gold embossing powder. This card uses a very similar technique. 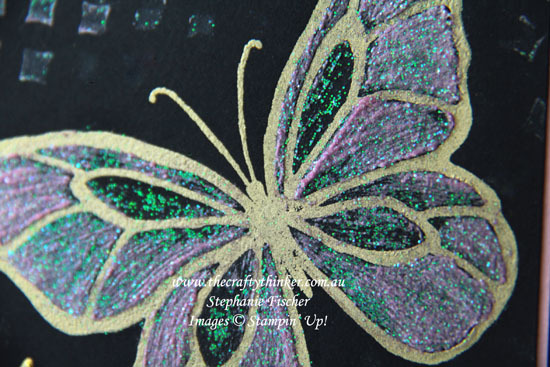 I started with a little bit of the sparkly Shimmering White Embossing Paste in a small glass container and mixed in just one drop of Sweet Sugarplum ink from a reinker. Then, using a small brush, I plopped a bit of the paste on the wings, working one segment at a time, and spread it out - keeping an eye on the direction of the brush strokes. In the darker areas, I didn't add any paste to my brush so it's mainly the glitter from the paste that's sticking to the cardstock and shimmering. I didn't want to waste the paste that I had left over so I positioned one of the Pattern Party masks and "painted" the paste through it. I really wish I hadn't because I think I made the card look too busy - but I'll know for next time! 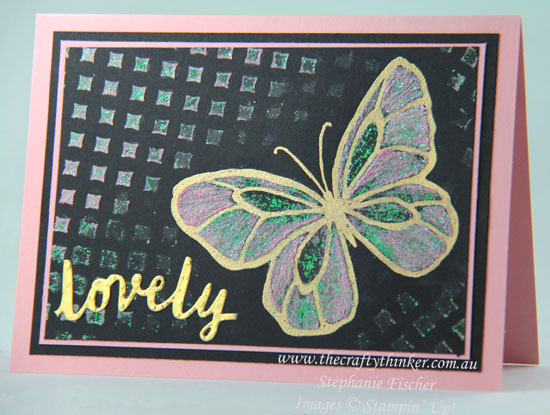 The word "lovely" was cut using one of the Lovely Words Thinlits with Gold Foil Sheet. I simply trimmed the word from the die cut.